When the ninth World Cup was played in Mexico it was the first time the tournament wasn't played in Europe or South America. The dates for the tournament was 31 May-21 June. The qualifications for the final tournament included 75 national teams and among these 14 teams qualified for the World Cup final tournament (Israel was the first representatives of the Asian-Confederation in the history of the tournament, and El Salvador and Morocco made also their first appearances). In addition, the automatically qualified host nation Mexico and England as the reigning champions were included. 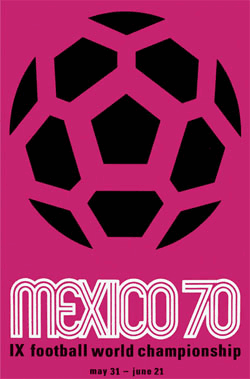 In 1964, it was decided that Mexico would be host country for the ninth World Cup. At that time Mexico was a nation that had accomplished very little in global football tournaments and the more reputable Argentina were displeased being overlooked once again. The FIFA World Cup 1970 was the first World Cup ever broadcast on television in color (notice that some countries still hadn't the possibility to watch color television). It was also the first World Cup with an officially sponsored ball. The manufacturer Adidas had created the ball, called Telstar. The tournament format would be divided into a group and a knockout phase. The first phase consisted of four groups in which two out of four teams would advance to the final knockout phase. Five stadiums were used for the tournament located in five towns. 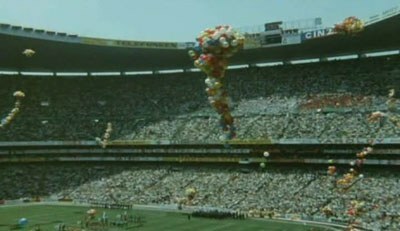 The final was played at the mighty Azteca Stadium with a capacity of over 100,000. The average attendance for the whole tournament would for the first time exceed 50,000. 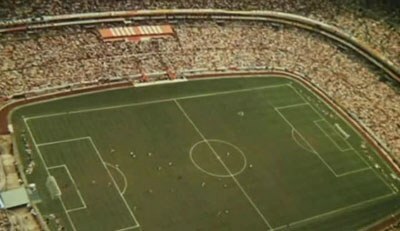 The mighty Azteca Stadium is packed. Two new rules were taken into practice for the first time in the World Cup. Substitutions that oddly enough hasn’t been allowed in previous World Cups was now employed – two per team in a game. The second new rule was the introduction of the red and yellow card (it had been tested in the 1968 Olympics). 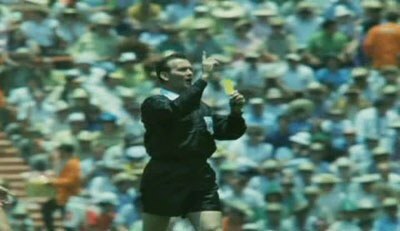 The referee Kurt Tschenscher would show the first historical yellow card in the opening match between Mexico and Russia. Despite that the red card hasn't been used earlier in World Cup, players had been sent of the pitch (somewhat curiously, no player in this tournament want shown a red card). The first yellow card in a World Cup match. 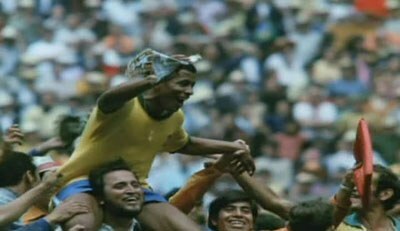 Brazil hadn't impressed in the last World Cup and didn't participate in the last South American Championship before the 1970 World Cup, but they had impressed in the qualification and new young players like Gérson and Jairzinho together with Pelé and Rivelino would be components in what became a classic national team. The reigning champions England had a strong team, but would be eliminated by West Germany in a memorable match. West Germany would meet Italy in one of the Semi-finals what would include seven goals and a ticket to the final for the Italians. Brazil took revenge from the defeat in World Cup 1950 by beating the Urugyans in the other Semi-final. The final match that followed between Brazil and Italy was seen as a battle between futebol d'arte (football as art) and futebol de resultados (playing for the result). Brazil that was representing the art would deliver another marvelous performance and becoming the first nation in history of the World Cup to claim three victories (they would also be the first team in a World Cup since Uruguay in 1930 to win all their matches and in ordinary match time). As a result, they would instead of Italy (which also had two previous titles), apprehended the Jules Rimet Trophy forever. Some football historians are considering this tournament as the end of an era. Jonathan Wilson writes "for the last time in major competition, there was space" and "never again would a side enjoy such success simply by throwing their best players on the field". FIFA World Cup 1970 would include 32 matches in which 95 goals were made (2,96 goals per match). Soviet Union, Uruguay, Brazil, Peru, Italy, Mexico, West Germany succeeds to go on from the groups to the knockout stage. Uruguay, Brazil, Italy and West Germany won their quarter-finals. Brazil would beat Uruguay in the first Semi-final and Italy would be West Germany in the second, which was an utterly dramatic. West Germany would win the match of third place and in the final Brazil would beat Italy with 4-1.